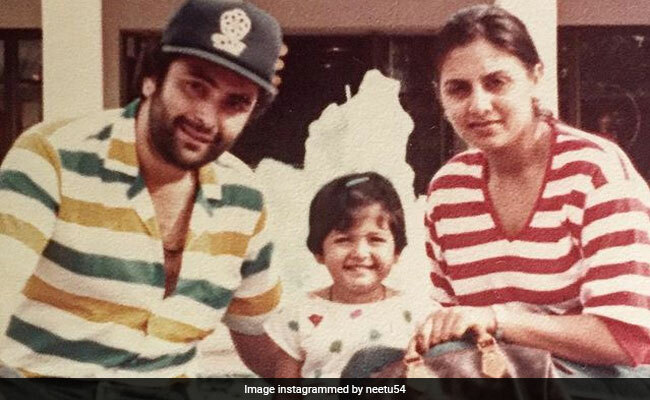 Celebrity couple Neetu and Rishi Kapoor will be celebrating their 39th wedding anniversary on Tuesday and to commemorate this day, the duo's elder daughter Riddhima Kapoor Sahni shared a heartfelt post on Instagram. Riddhima shared a collage on her Instagram timeline and juxtaposed throwback photos of the couple. "You two are my life - center of my universe - Happy Anniversary to the best parents in the whole world! I love you both endlessly! You were you are and will always be the greatest example of the perfect couple, love you mom, love you papa," Riddhima captioned the post. While one of the pictures in the collage features Rishi Kapoor and Neetu from when they were very, very young, another picture also features little Riddhima with the couple. Other pictures which are part of the million dollar collage have been clicked recently. Rishi Kapoor and Neetu got married on January 22, 1980. While Riddhima, the couple's first child was born in September 1980, Ranbir was born two years later. Congratulatory comments started pieing in as soon as she shared the picture. Actress Bhagyashree also commented on the picture and wrote: "Happy anniversary to the beautiful couple." Rishi Kapoor and Neetu Kapoor's first onscreen association was for 1974 film Zehreela Insaan. Neetu Kapoor was just 16 when she co-starred with 22 year-old Rishi Kapoor in the film. The couple have also co-starred in films like Do Dooni Char, Besharam, Kabhi Kabhie, Rafoo Chakkar and Amar Akbar Anthony. Rishi Kapoor and Neetu are currently in New York where the former is undergoing medical treatment for an undisclosed disease. Their children Ranbir and Riddhima and other family members often visit them in the Big Apple. Rishi Kapoor and Neetu along with son Ranbir left for New York in September last year. Riddhima Kapoor Sahni is married to businessman Bharat Sahni and the couple are parents to seven-year-old Samara.